As it transitions its production brewing program to Full Sail in Hood River, Laurelwood has released Green Elephant IPA in six-packs for the first time. The popular beer had previously been available only on draft and in 22 oz bottles. Green Elephant will join Laurelwood flagship Workhorse and Free Range Red in bottles and Red Elephant IRA in cans. It represents their second seasonal six-pack, replacing Vinter Warmer, which was available November through February. Recall my earlier story announcing Laurelwood's move from the CBA's Woodinville facility to Hood River. That change came about because the CBA said it wanted out of the contract brewing business. Subsequently, we learned the Woodinville brewery has been leased to Pabst, which has an option to buy it within three years. "The transition took a little longer than I had hoped, largely because we were waiting for TTB approval," De Kalb said. "But it's going well and I expect we'll be fully brewing in Hood River by the beginning of April." So where are the current six-packs of Green Elephant coming from? Sometimes you do what you have to to hold onto precious shelf space in key accounts. "These first two six-pack batches of Green Elephant were brewed at our Portland brewery and bottled by a mobile bottler," De Kalb said. "We did it to keep our seasonal six-pack slot in area Fred Meyer stores. That beer will just barely keep those stores supplied for a month." Fans can expect to see the beer at Freddy's in coming days, but probably not anywhere else for a few weeks. They brewed a double batch of Workhorse and Green Elephant this past week at Full Sail. That beer will be bottled in two weeks and will help fully fill the supply pipeline. Green Elephant IPA, if you don't know, has been a favorite of hopheads since it appeared in 2003. It features brilliant pine, floral and citrus hop notes. It may be the first of a number of special releases in 2016, as the Full Sail arrangement gains momentum. 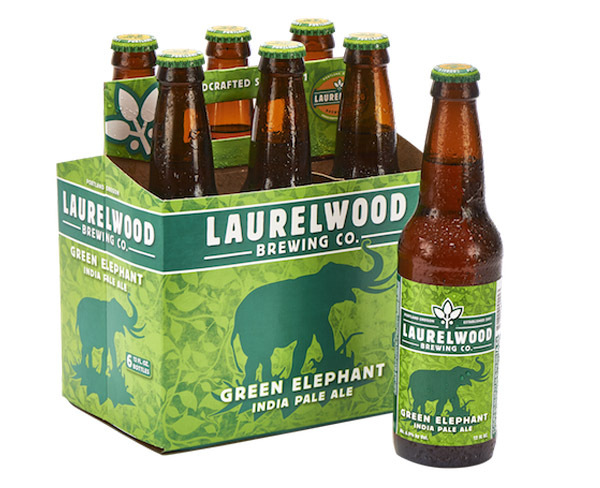 “We have some exciting releases planned this year and Laurelwood fans can expect to see more of our beer in six-packs,” marketing director James Buxman said in a press release announcing the Green Elephant launch. Nice. I'm a big fan of their Red Elephant in cans.